Attitudes toward cannabis are changing rapidly. There are currently 26 states and the District of Columbia that allow cannabis cultivation for medical reasons. Seven more have legalized marijuana for recreational use and even Canada recently announced that it will legalize marijuana for recreational use nationwide by July 2018. These figures could soon be outdated; it seems that cannabis restrictions are loosening at a faster and faster rate. In the New York legislature, two bills to legalize and regulate marijuana were introduced earlier this year by Democratic Senator Liz Krueger, and are currently in committee. Their fate is uncertain under the Cuomo administration, which has previously been against legalization, although some advocates believe that his position could be evolving due to changing public opinion. Regardless of one’s personal beliefs on whether marijuana should be legalized or not, it’s likely that New York State will be considering this path soon—and should be thinking about its impact on building energy efficiency if it is legalized. Although outdoor agriculture has its own associated carbon emissions, most of the CO2 emissions produced by cannabis cultivation come from the fact that it is usually grown inside, often in secret. This can be done for any number of reasons, from increased yields to security to pest management. The most obvious way to reduce the energy impact of cannabis cultivation is simply to grow it outside. In fact, it may be said that the only way to grow cannabis in an energy-efficient way is through outdoor cultivation. However, this may not be an option; even in counties where cultivation is legal, some local codes still mandate that it be grown indoors. This is not without a significant cost to the grower. Almost half of a grower’s operating expenses can go toward electricity, and costly upgrades to the power infrastructure are sometimes necessary to provide enough for even a small-scale operation. If outdoor cultivation is not possible, fairly standard building efficiency upgrades to these facilities can significantly reduce energy use. 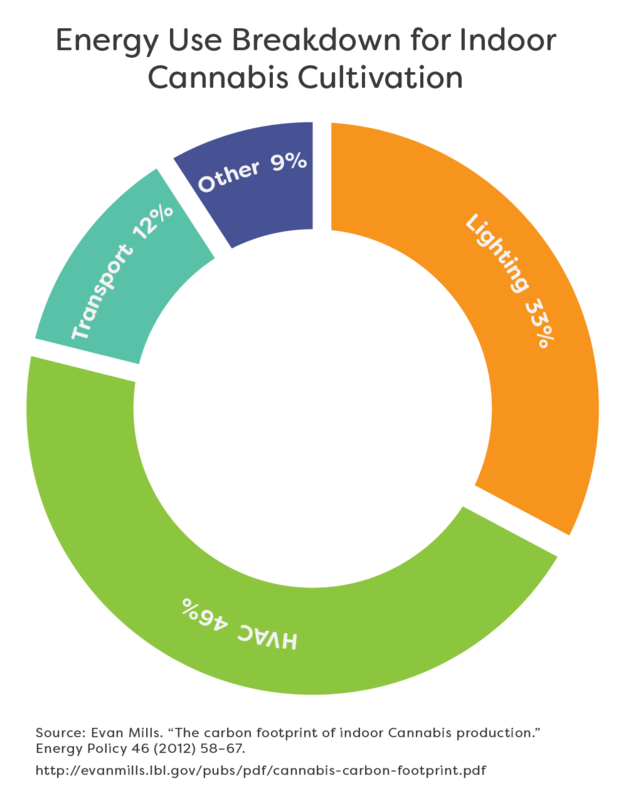 Most of the energy use comes from lighting and HVAC systems, which the grower can mitigate by using high-efficacy lighting, daylighting, offsetting the load with renewables, and installing an efficient, balanced HVAC system. Although these systems pay off quickly, many growers are wary about investing in equipment that will take a year or two to start paying off, out of fear that their operation may be shut down or will have to move quickly. Under legalization, growers would have more incentive to install efficient equipment as a long-term business solution rather than focusing on quick, black-market profits. There is an economic side to consider as well. 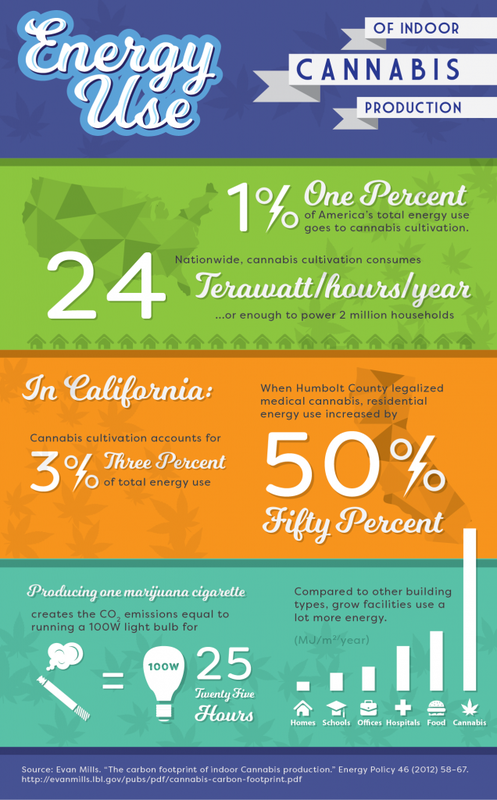 When marijuana is legalized, its price tends to drop drastically although energy rates stay the same, meaning that many growers could find their operating costs skyrocket in relation to the price of their product. Under legalization, indoor cultivation without significant energy efficiency improvements may no longer make economic sense for small business owners. How should energy concerns be taken into account in any legislation that regulates cannabis production, especially whether or not it can be grown outdoors? In the building and energy codes, include stipulations for indoor grow facilities. For example, decreasing the U-value of the thermal envelope could actually save energy, as it requires less HVAC capacity to get rid of equipment thermal loads. Other than the Mills study, this is a vastly understudied subject. Utility companies likely have data that building scientists and lawmakers could use to more accurately determine what energy costs are associated with marijuana cultivation. This information should be used to inform confident, fact-based legislation and regulation. Utilities should be empowered to discuss the challenges and options of providing service with growers, and allow them to participate in utilities’ energy efficiency incentive programs. Growers should be educated on energy efficiency best practices. Allow grow facilities to develop a platform where they can share information on water and energy use, enabling them to see how their operations stack up to the baseline and where energy usage can be reduced. Although the debate about cannabis legalization promises to remain a divisive issue, it is clear that there are many opportunities to minimize the impact of a very energy-intensive industry. 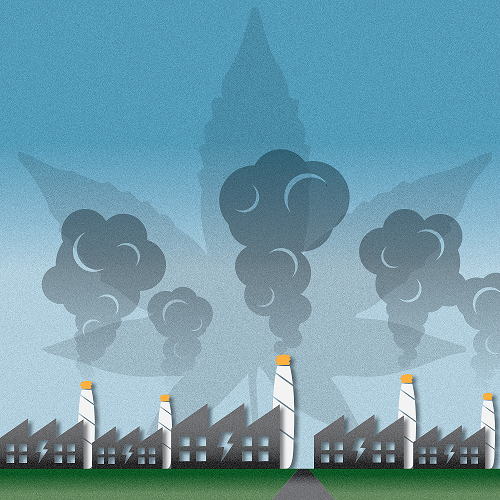 Marijuana is an issue that arouses strong political passions from both sides of the aisle, but it is clear that where energy efficiency is concerned, there are plenty of opportunities for both sides to cooperate. Even on divisive issues like this, everyone in this industry is still interested in reducing our impact on the earth we all call home.